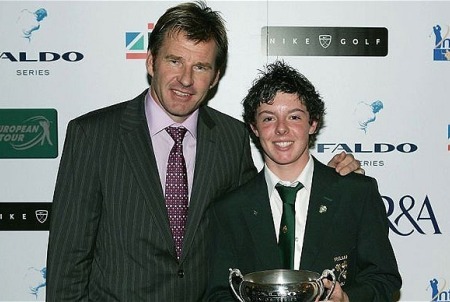 Rory McIlroy, resplendent in his Golfing Union of Ireland blazer, receiving the Faldo Series under 15 award from Nick Faldo in 2004Rory McIlroy is having fun on the course again - so much fun that not even former world No 1 Tiger Woods is beyond the pale when it comes to cracking a few jokes. Fresh from his latest triumph in the FedEx Cup series in Indiana, the Northern Irishman made an appearance on NBC’s Late Night with Jimmy Fallon on Wednesday that said it all about how comfortable he now feels as the game’s dominant player. “So would I,” McIlroy replied impishly, clearly loving every second of his new role as golf’s undisputed top dog. Publicly at least, not even Woods would disagree. Having watched McIlroy hold off his final round charge to win the Honda Classic in March and then win the US PGA by eight shots and the last two FedEx Cup play-off events, the American has more motivation than ever. McIlroy, it appears, is up for the fight. “It might be weird for him, I think it’s great!” McIlroy said, laughing. Whether Woods can pick up the gauntlet remains to be seen given McIlroy’s new levels of confidence. What we’ve seen from the 23-year old over the past month is a far cry from the dark days of May and June, when he missed four cuts in five starts and looked so unhappy on the golf course that many wondered what had become of the phenomenon who had cruised to that record-setting, eight-shot US Open triumph less than 12 months earlier. “The big thing about him now is that we’ve been able to get his game back into shape gently. 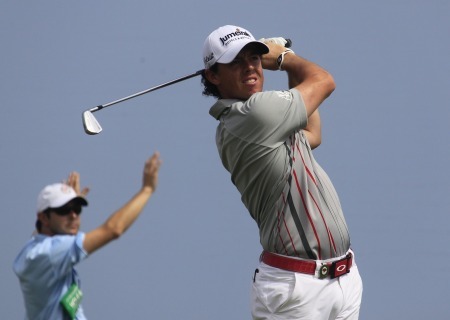 Rory’s swing has always been very organic. He was always into hitting balls in his teenage years. He hit lots of balls. He was never over-coached and he was never over-practiced. But at the minute he doesn’t need to be standing on the range for hours and hours. It only takes an hour to fix something.” - Michael Bannon. Picture via belfasttelegraph.co.ukYet McIlroy’s coach Michael Bannon believes that the answer is simple: his pupil put technique aside, walked away from the tyranny of the driving range and rediscovered his love of playing the game for the game’s sake. “Practising is one thing but when you are out playing, you are just playing golf and seeing the shots,” Bannon said this week. “That’s what it’s about. “The big thing with Rory is just getting him back on automatic again. That’s something he started to do at the Bridgestone in Akron and it’s been there ever since. Bannon also pointed to McIlroy’s improved courses management as a sign of growing maturity and a close relationship with his caddie JP Fitzgerald. “It was a strength of mine when I played,” Bannon said. “But it’s not coming from me. That’s JP’s job. “I’ll give you a very simple example. If you watched him on the back nine at Kiawah Island, when he was in the lead. He just had to stay out of the water on the right hand side. He just played it down the left and just chipped and putted because his short game is so good and got the job done. “In years gone by he might have gone at the pin but he is thinking better than ever. You saw it in the Honda Classic too when he won there to go to world No 1 for the first time. He just steered away from trouble and got it done. 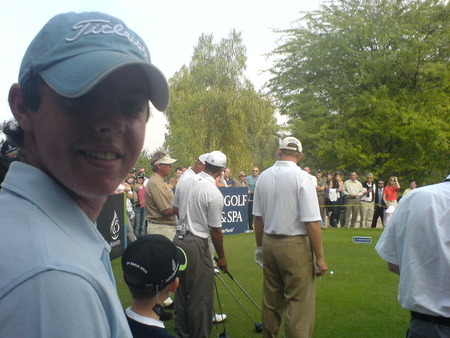 Rory McIlroy plays a practice round with Nick Faldo“But the big thing for me is that he is enjoying the game more, he is thinking better, he is playing golf, playing the game. It is what he always did as a kid and it’s great to see him doing it this year. 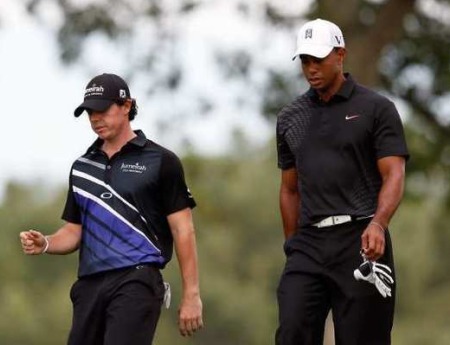 Faldo knows better than most what makes a top player tick but wonders aloud if Woods’ confidence hasn’t been irreparably damaged as McIlroy’s has soared. Speaking at Lough Erne Resort in Co Fermanagh, where he hosted the Faldo Series Grand Final once captured by McIlroy, the Englishman wondered aloud of Woods, with his aura now tarnished, could still compete with the likes of McIlroy. “Tiger was always in everybody’s head,” Faldo said. “As soon as he walked on the range, as soon as they saw him on the leaderboard, the players would use up energy just thinking about him. “And the reverse of that is Tiger knows that everybody knows that he is inside his own head. Before, he was just brutal. He was a demolition man, wasn’t he. He would just plough through everybody. Dale Stephanos’ brilliant illustration of the Woods-McIlroy dynamic for Golf Digest. “Now he’s struggling for confidence and everybody knows that he’s struggling to find his own self-belief and the confidence that he used to have. That’s a big swing there. Tiger is now trying to find his confidence again and people know that. “He show flashes of it but he doesn’t finish it off. His weekends have been pretty rough in all the majors. It is going to be very interesting for the players to see how he deals with it. What this will mean for McIlroy remains to be seen and while Faldo believes McIlroy could be the man to reignite Woods’ competitive fires, he’s not making any bold predictions. “Tiger’s competitive,” Faldo said. “I’m sure he doesn’t want anyone else having his spotlight. He wants to beat this kid now. “Tiger has a real goal, to come out and beat these youngsters again. He’s still just 36. He’s still competitive. He still believes and he wants to show them he is still the master. Rory McIlroy hits his tee shot at the eighth on Friday. Photo Eoin Clarke/www.golffile.ieNick Faldo hailed Rory McIlroy’s sensational Sunday 66 as “a perfect day.” But the six-time major winner and former McIlroy mentor reckons the Ulsterman’s 75 in Friday’s tough weather was a massive key to what eventually became an eight-stroke victory procession. Obsessive McIlroy? "No, I'm not like that"
Rory McIlroy speaks to the press at Muirfield. Picture Fran Caffrey/www.golffile.ieWhen it comes to players talking about Rory McIlroy, only Padraig Harrington and Paul McGinley have come close to hitting the nail on the head. He’s more like Phil Mickelson than Tiger Woods. Or Nick Faldo. Fatherly Faldo calls Rory criticism "a little caring, loving help"
Nick Faldo says he’s trying to help, not attack, Rory McIlroy. 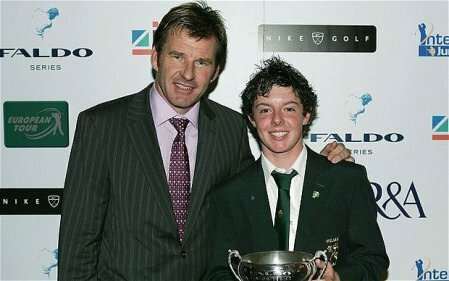 Picture Eoin Clarke www.golffile.ieNick Faldo has been in “I told you so” mode about Rory McIlroy’s struggles but insists he still loves the kid.